-Has had a camera in hand since Kindergarten. -Doesn’t believe every photo needs to be crisp or noise free to be perfect and loves the soft look of high speed BW film. -Likes the big city sights of the Centre of the Universe, (Toronto) but the Picture Province of Canada (New Brunswick) shall forever be his home. -Is eccentric, a fan of black humour and is nuttier than a squirrel turd when left to his own devices and is a bit of a perfectionist. -Suffers from existential angst and ponders big questions till his head hurts. -Doesn’t like giving clients thousands of mediocre images but a few hundred awesome ones. 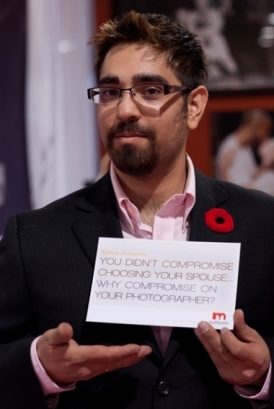 -Has photographed a wedding in the Supreme Court of Canada, other dignitaries on the floor of the House of Commons and national sporting events. -Believes in not taking pictures but making art. -Is easily bribed by good food and getting a chance to travel. -Can usually be found bouncing around the GTA, Ottawa and New Brunswick but goes wherever his clients need him to go.